100331_MRTV, originally uploaded by nevardmedia. 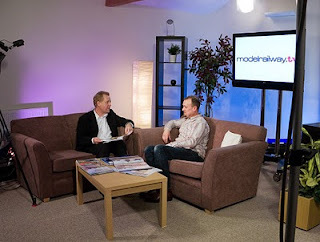 A few weeks ago, I was invited down to the studios of Model Railway TV in Arundel, Sussex to chat about Catcott Burtle and other aspects of this all consuming hobby. I wasn't expecting this to be online for a few weeks, so was quite surprised this morning to see the interview there. I think I'll be keeping the day job by the way - being more proficient behind the camera! 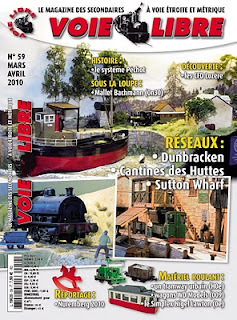 Lots of UK interest in this issue of Voie Libre one from the friendly narrow gauge LR Presse publishers in France. The editor, François Fontana is a regular at ExpoNG and hence the large amount of material to interest us. All too often niche hobby publications are drab and look more like the parish news rather than a fun tool to promote a hobby. They frequently take themselves far too seriously and create a stuffy elitist image which is guaranteed to put new people off the hobby. By total contrast, Voie Libre is a happy bright magazine, with a strong welcoming graphic quality - the text, photographs, diagrams and tasteful use of coloured backgrounds gel together to produce a magazine that is hard to put down. Illustrations; rather than being the common and often sterile computer generated variety are good old fashioned pen and ink performed with a wonderful artistic 'organic' style that just make you want to model them in 3D! François, is without doubt a fabulous model maker, brilliant artist and cracking photographer - can there be a better combination? If that's not good enough, you can download an English translation from their website too! It's interesting what people used to eat in 1892 when pushing out the boat, or in this case opening a new railway line. Click to enlarge so it's readable! 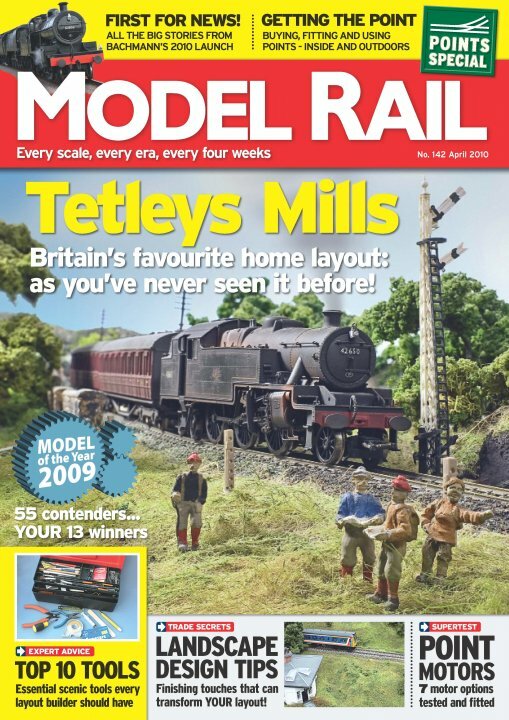 April 2010 Model Rail has hit the newsagents, and although I'm rather biased I do have to say that it is really rather good! The content goes on forever with a plethora of really useful, inspiring, well written and illustrated features. The repro is top-notch too - something as a photographer I'm very very fussy about, and I can safely say that this aspect without doubt is a market leader in this area. BACHMANN 2010/11 PREVIEW: All the big stories from Bachmann's 2010 launch. POINTS SPECIAL! Buying, fitting and using points, fitting point motors outdoors, manual point control and more! SUPERTEST: Buying and fitting the right point motors for your layout. Don't buy anything until you've read George Dent's unique comparative test. 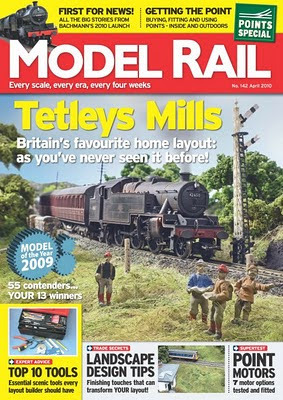 TETLEYS MILLS FAREWELL: A special 12-page tribute to Britain's favourite 'layout that never leaves home', which will be dismantled in 2010. Dave Shakespeare reviews the changes made since our last visit and looks forward to his next project. 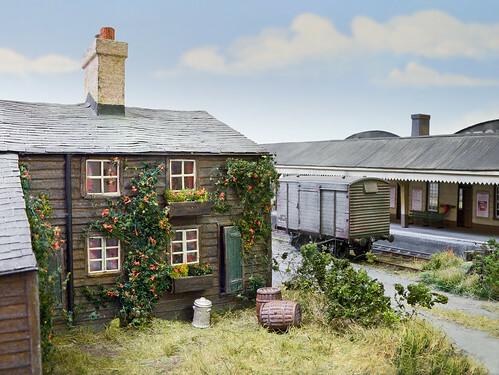 REVIEWS: MTH 'O' gauge 'Duchess', Heljan Class 20, limited edition Bachmann Class 47s, Graham Farish MOA wagon and much more. LANDSCAPE DESIGN PART 2: More great tips from Peter Marriott on how to give your layout a 'real world' look. 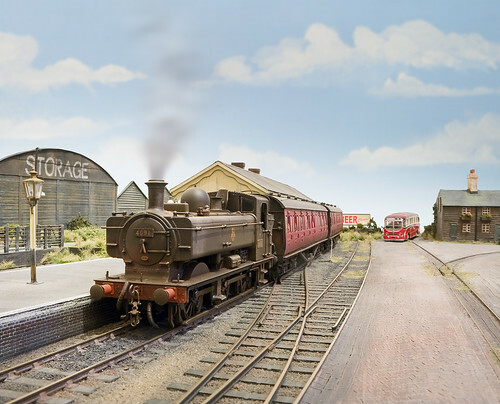 CEPs and BEPs in 'N' gauge: Grahame Hedges builds Southern Region EMUs. TOP 10 TOOLS: The ten most important items for any scenic modellers' toolkit. 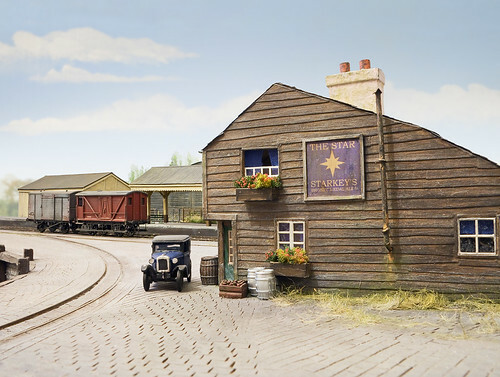 Cliffordsbridge: A 'OO' gauge layout that never leaves home using ready-to-run diesels and rolling stock. Q&A, Show & Tell, Masterplan and all your favourite regular features. Blurb is a great way to mess about trying ideas out for a possible book. I have been asked buy a publisher to come up with a model railway book idea, but to be honest I'm not quite sure where to start. Maybe something about scenics and some of the techniques used on my layouts? In the mean time I'm messing about with some mock-ups I'm hoping will polarise the various thoughts I have. The joy of Blurb is that you can end up with a high quality printed book of whatever ideas one might have - and the great thing is that it does not have to be the slightest bit commercial! The idea here is for a 10x8 inch landscape format book as a 'toe in the water' which could be sold via the website or at the occasional show I do. Clicking on the images here will take you to a bigger picture. nevard_100309_combwich_IMG_6448_web, originally uploaded by nevardmedia. With the change of regional boundaries and the operation of the former S&DJR route becoming under the control of the Western Region from 1958, ex GWR locomotives started to appear in place of Midland engines. Here we have Templecombe's ex GWR pannier tank No. 4691 as it prepares to leave Combwich with the 11.15am service to Templecombe on the 12th September 1961. Right (click on) - another idea scribbled on the back of an envelope last night during a tea break which was then cleaned up in Photoshop over breakfast this morning. I could use Catcott's fiddle yards I guess. 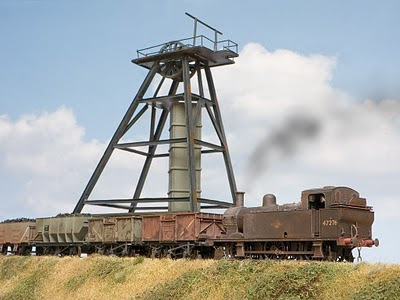 Having acquired several Bachmann Scenecraft seconds and some Skaledale stuff which could be bashed about a little mixed in with a dash of scratchbuilding, something could be hacked out quite quickly I guess. The curved nature would be a break from the norm, with the tandem pointwork being a good focal point. Trackwork will all be done properly this time, either useing C&L as with Catcott or maybe even handbuilt using spiked code 55 flatbottomed as Brian Harrap has on his super Quai: 87 layout. Of course a mix of the two could aslo look good. 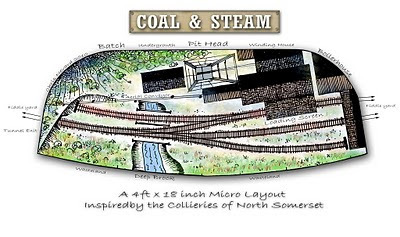 A diorama approach will work well with what could be quite a deep layout height wise, starting low at the front with the brook rising up by 18 inches on the left hand side with an old 'batch' (slag heap) balanced by colliery buildings on the right. The two parallel lines crossing from the middle to the left hand side are a possible aerial cable way to remove waste - if that could be made to work that would be great fun. Additional fun and games could be had with actually loading wagons too via a hidden shoot from the rear of the layout down to the screen which is middle right. The look I'm after is a cold winter's day (even though this sketch looks 'summer') inspired by the last days of steam at Writhlington on the old S&DJR. Wagon stock would be 99% open wagons and locos anything from a Sentinels, 'Bagnalls' (Jinty), Pugs and maybe even a Hymek - no hard rules! nevard_100307_combwich_IMG_6441_web, originally uploaded by nevardmedia. The Star public house on the quayside at Combwich. Ivan Locksmith's old Austin has certainly been getting around recently. Note the modern metal casks (carrying a keg beer called 'Tantivy') that make the elderly Austin look rather out of place - though of course in those pre MOT days it was quite common to see pre-war cars on the roads even in the 1960's. Starkey Knight and Ford was a well known Tiverton and Bridgwater brewery which sadly became swallowed up by brewing giant Whitbread in the 1960's. Their beers started to be replaced with Whitbread ales from around 1966 in the pubs. 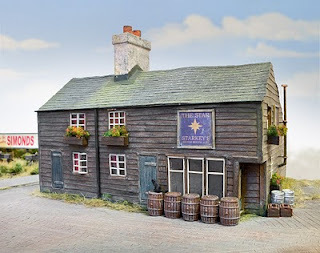 For any readers of this blog living in the real Combwich, please note that this is just a load of old bull, The Star is just a ficticious model - by contrast the brewery information is fact. nevard_100307_combwich_IMG_6444_web, originally uploaded by nevardmedia. With Combwich still being in a temporary dismantled state, it's given me another chance to have a go at capturing some new angles never before photographed. Here's the rarely seen view of the rear of The Star. Right: the view of the front of the shabby little building which was made mainly from scraps of paper and cardboard. 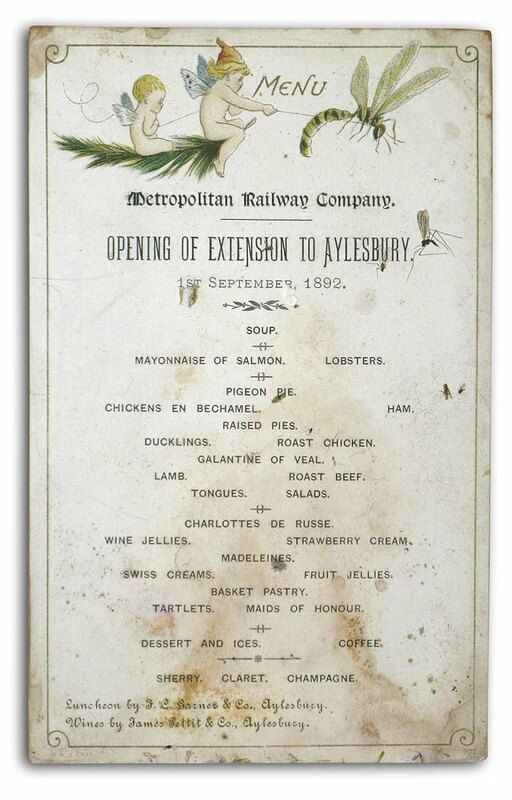 It is in fact based on a cobblers that used to be in Weybridge, Surrey that vanished around 100 year ago. The slates were applied individually and I think were worth it. The roof line was intentionally distorted to give it that aged look. nevard_091219_cementquay_ext_IMG_6164_web, originally uploaded by nevardmedia. Highbridge's final Midland 1P 58086 managed to avoid scrapping in 1959 and in fact ended up in private ownership pottering about with wagons in Old Quarry Wharf on the banks of the river Severn. Here is the old girl captured on Ivan Locksmith's Leica in September 1963. I'm normally the other side of the camera, either when I'm working in telly land or on assignment for Model Rail Magazine. 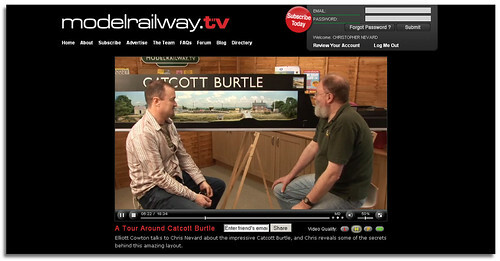 On Tuesday though, I was asked down to chat about Catcott Burtle and photography at Ashdown Broadcasting's new HD web-TV channel Modelrailway.TV. 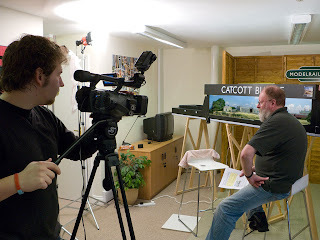 Right: Setting up Catcott Burtle in preparation for my nerve racking interview about the layout. Modelrailway.TV's Elliott Cowton seen here did a great job at ensuring everything went smoothly. To those not in the know, Modelrailway.TV is a high definition on-demand channel specifically aimed at showing complete beginners and even the more experienced how to improve their model making skills and to take some of the mystery out of the more confusing gobbledegook in model railway land. Ultra fast web streaming is increasingly opening up opportunities for niche subjects to be aired to a hungry and enthusiastic audience; allowing all sorts of fresh channels that could never afford to broadcast via more conventional means. Cable and satellite can run into millions per year, and that's just for an uplink or connection - that's before you even start production! Left: 'On the Sofa', being interviewed about the hobby and photography by Ashdown's David King. I'm the nervous one on the right, I imagine you've guess that though! At least I ironed my shirt! We to tend associate streaming video on the web with low res, highly compressed blocky images as seen on the likes of YouTube; so when viewing Modelrailway.TV's output I was thrilled to see that with most of the programming you have the option of of downloading proper HD widescreen material, this is because production is to broadcast TV standards. With the gap between web and conventional television forever closing, it cannot be too long before web-TV will be sitting right along side familiar satellite and terrestrial broadcasting - all via the same box underneath the TV in the living room. 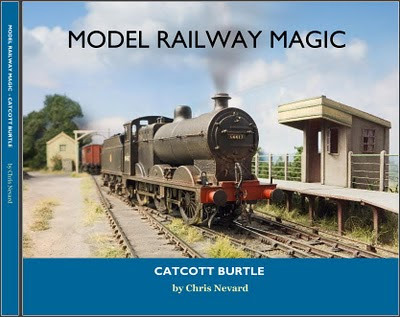 Keep an eye out for Catcott Burtle in Modelrailway.TV's run-down later this spring.